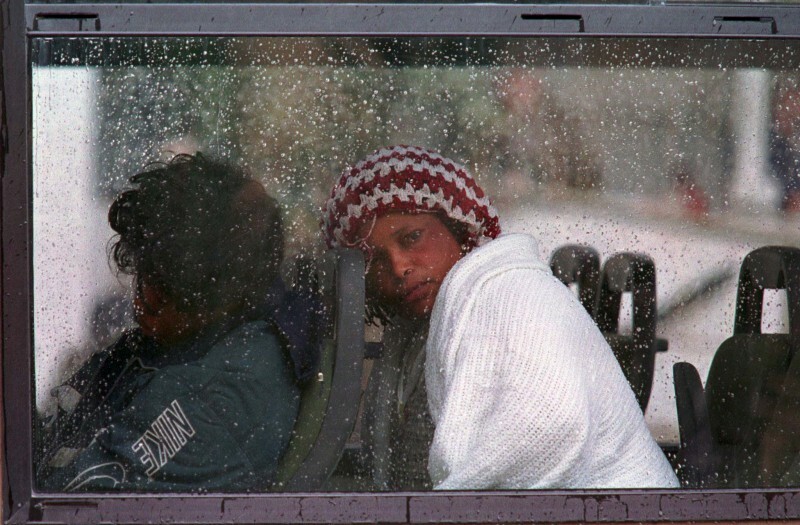 A refugee from Sierra Leone, exhausted and lucky to be alive, slumps her head against the head rest on a Maltese Army coach near the Russian survey ship “Akademia Nikolas Strakov” in Grand Harbour in Valletta on December 6, 1998. The group, of 52 asylum seekers, was rescued by the ship’s crew 94 miles south-west of Malta. The 43 men and 9 women, from Sierra Leone, Egypt and Algeria, were found on a small open boat in rough seas. Eight of their colleagues are missing, believed drowned and a search for them was abandoned at sundown. They are believed to have been on their way to Italy. This picture was one of the very first I ever took of irregular immigrants, back in a time when migration was not an issue in Malta. I photographed several migrants, in such poor shape that they could barely walk, being carried off the Russian ship, but this image, one of the last on my roll of film, is the one which has lingered longest in my mind. The woman’s vacant stare, the raindrops on the bus window, the dull light – I knew I had captured something poignant and special the moment I clicked the shutter. It made the front page of The Times of Malta the next morning – to a large portion of the Maltese population, the photo was their introduction to a story that has continued to fill the news pages ever since. On a personal level, I realised that this was a story with wide international interest when early the next morning, I switched on Italian TV, happened to come across a newspaper review and saw that my pictures had made the front pages of most of the Italian national papers. Dear Islanders. Your wonderful work brought back the past to me. Please do you have more of this DECECEMBER 1998 pictures? Because I was among the rescued on December 6th 1998. Dear Beth, thank you for visiting the site and commenting. I hope you’re doing well and have successfully settled and integrated. Yes, there are a few more pictures from December 1998 – it’s a day I remember very clearly. I will try to post some more here in the coming days. If you can email me directly on dzammitlupi@pobox.com , I’d appreciate it.